A long time ago, in a galaxy far, far, away . . . . . Okay, maybe that long ago, and not really that far away. Our story begins back in the 80's in the little town of Galeton, Pennsylvania. We meet up with two best friends. These two young ladies walked to piano lessons together every Tuesday after school . . . Upon growing up, the first young lady begins a family and the other a piano studio. Eventually a piano is acquired for the children, who by now are taking lessons from the best friend of years gone by. Fast-forward to the Summer of 2002 . . . The children have moved on to other instruments and the family has moved on to another home. And the piano? Well . 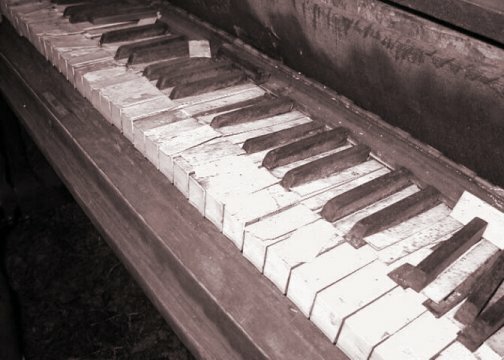 . . it's fate was decided by none other than a friendly piano tuner. He said he could try this or that. The strings could be stretched, but it would probably take 13 or more tunings to get it anywhere near where it needed to be and even then there were no promises. Did he know anyone who would like it? Would it be useful for parts? Would he like to keep any of them for himself? After a long, awkward silence, the tuner looked her dead in the eye and said, "Ya know, pianos make a real cool pinging sound when you burn 'em."